Call it a grass-roots movement. Powered by his push to legalize cannabis, a politician edged out of Prime Minister Benjamin Netanyahu’s Likud party because his views were too extreme may become the kingmaker in Israel’s next government. 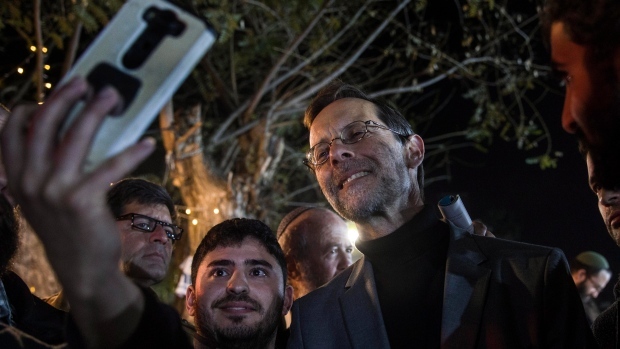 Moshe Feiglin’s new Zehut party is riding support from younger voters to surge in polls, which now show it entering parliament after Israel’s April 9 elections. It’s not a single-issue party, but some supporters are secular leftists or regular stoners looking past Feiglin’s religious and nationalist zeal. Zehut -- Hebrew for “identity” -- espouses libertarian social and economic policy. “The concept of faith, I believe, goes together very well with free markets,” he said. Even his campaign manager, Lior Yado, said she previously voted for left-wing groups but was attracted by Zehut’s embrace of personal freedom and separation of religion and state. But it’s the party’s stance on marijuana that’s delivering the electoral goods. After polling for weeks below the 3.25 per cent threshold needed to enter parliament, Zehut is now performing well enough to win four of parliament’s 120 seats. In a tight election, it may tip the scales in favor of a right-wing bloc led by Netanyahu or a center-left alliance headed by his top challenger, Benny Gantz. Feiglin hasn’t endorsed either one, but has made legalization a condition for joining a coalition. Some warn of a honey trap. The 56-year-old Feiglin rose to prominence leading protest movements against the 1993 Oslo Accords and was convicted of sedition. He also wants to strip a Jordan-based Islamic trust of its religious custodianship over the contested Jerusalem shrine known to Muslims as Haram al-Sharif and to Jews as Temple Mount. Feiglin, who’s unsuccessfully challenged Netanyahu for Likud’s leadership, won a seat in parliament in 2013 but was pushed to a low spot on the 2015 Likud ticket. So he quit to form Zehut. Even though he’s been transformed into a pot-smoking hipster in internet memes, Feiglin says he doesn’t smoke at all, and doesn’t look the part in his suit, skullcap and owlish glasses. His campaign got a boost when Israel’s traditional pro-legalization Green Leaf party sat out the election.